This is really not an "what are you eating now" thread unless you happen to be eating an all-time favorite. 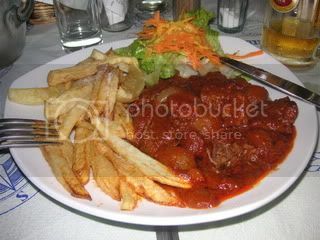 This is more for you to post a dish that you really love. Give some detail. What are the sides that you enjoy with the main course? Can you cook it yourself? Favorite spices? Is there a recipe you would like to share? Any pictures? I don't mind it turning into a conversation thread at all either, but please post one favorite dish at a time. So we can savour it! It could also be treats and goodies as well. 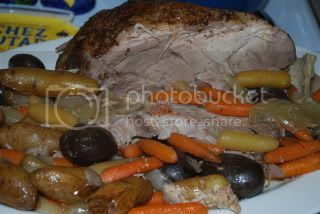 How about a delicious pork roast with roasted vegetables such as potatoes and carrots. Mmmm what's not to like? And the smell wafting thru the kitchen at about the second hour of cooking is devine. It's also very easy to throw together. Take a pork roast. Season it liberally with salt and pepper. Peel and quarter some carrots and potatoes and an onion or two. Throw it in a preheated oven for about three hours. BAM! Serve it with some salad and dinner rolls. Maybe some corn as well. Man! That's some good eatins! Boy, this thread is a-hoppin! Here's something I really love. Very versatile too as far as what you can put in it. I like to hard-boil about four eggs. Mix in about two tablespoons of mayo. A 1/4 teaspoon mustard. A splash of balsamic vinegar for some zing and some freshly ground pepper. I've tried recipes where melted butter was added which adds richness and really holds it in place after it's chilled. Then you put it in fridge to chill. Makes delicious sandwiches. Do people make egg salad in the UK or Europe or is this an American thing mainly? I'm curious. We make it here in Canada!! To me, not many things are better than a BBQ pulled pork sandwich. Oddly, though, it's the only form of pork I really enjoy! Give me one of those babies with coleslaw, fries and lemonade, and I'm a happy camper. Dittany wrote: To me, not many things are better than a BBQ pulled pork sandwich. Oddly, though, it's the only form of pork I really enjoy! That's one of those things that crockpots are made for. Effortless to make. This here recipe is the bomb. Homemade BBQ Chicken. I've made this several times and it's always gone done a success. 1. Mix all ingredients for the sauce in the crock pot. 2. Add the chicken, try to coat it well in the sauce. 3. Cook on high 3-4 hours, or until chicken is fully cooked all the way through. 4. Then shred or cut up the chicken, and replace it in the BBQ sauce in the pot; mix it all up so all the pieces are coated. 5. You can keep the crock pot on low to keep the chicken warm for serving on hard rolls. Get a bag of frozen chicken breasts. They are perfect for crockpot recipes and are usually cheaper than refrigerated chicken breasts. Great side dish. Goes with all kinds of stuff. I especially love it with deep fried fish. So simple too. Shredded cabbage and carrots and dressing. Cabbage is underrated. It's one of those things you find in a lot of dishes, but you almost never eat it in it's basic raw form. Thanks for the recipe; I might just print it out for my mom, since I don't cook. And you're quite right about cabbage. I like it in coleslaw, obviously, and throwing it in soup with ham and potatoes is always a treat, but I'd never eat it raw. Ick! Speaking of coleslaw, do you like yours with a vinegar base or with mayonnaise? Sir Knute wrote: Do people make egg salad in the UK or Europe or is this an American thing mainly? I'm curious. Erm...are we allowed to talk about delicious drinks that we like? If so, I must rave about the Arnold Palmer. Named after the famous golfer (it's supposedly his favorite drink), a traditional Arnold Palmer is made by combining unsweetened iced tea and lemonade. So yes, I can make it myself. The great thing about this drink is that there are almost endless variations one can apply to it. For instance, I have had a version with pomegranate black tea--WOW. And raspberry tea is a good choice as well. Drink this with sandwiches and salads. Bump. I made this earlier lol. 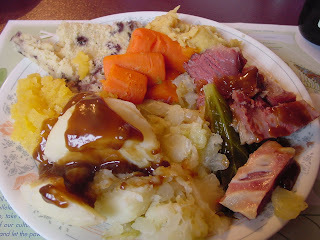 Jiggs dinner, named after a comic strip character, is a traditional meal commonly prepared and eaten on Sundays in many regions around the province of Newfoundland and Labrador, Canada. The meal typically consists of a combination of pickled salt beef (or salt riblets), boiled potatoes, carrots, cabbage, turnip, turnip greens, bread pudding, dressing, pease pudding, and a cooked turkey, chicken or beef roast. Condiments sometimes include mustard pickles, pickled beets, cranberry sauce and butter. The leftover vegetables from Jiggs dinner are often mixed into a pan and fried to make a dish known as ‘cabbage hash' or ‘corned beef and cabbage hash'. Corned beef and cabbage is the favourite meal of Jiggs, the central character in the comic strip, Bringing Up Father by George McManus. I am a fan of the British traditional chicken tikka musala. 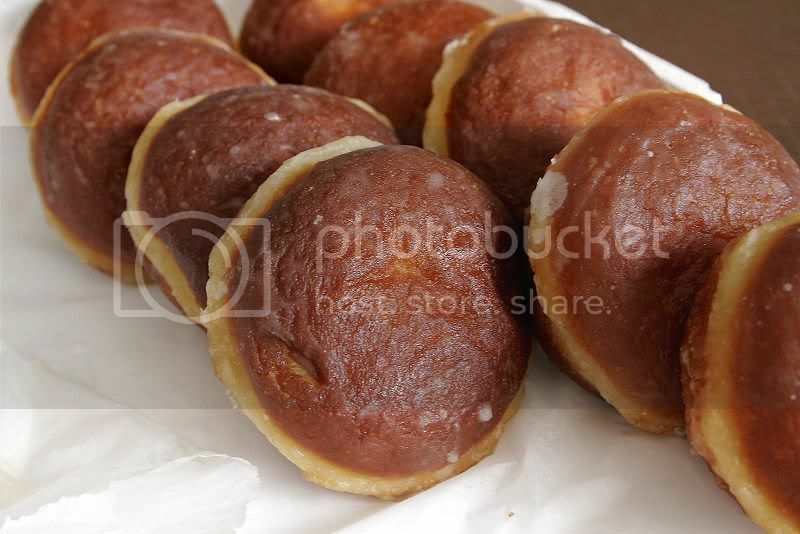 Paczki (Pronounced punch-key). Polish doughnuts. Chicken Jalfrezi, rice and naan bread.